The Quinnipiac rugby team lost 40-22 to Dartmouth in a rematch of the 2017 NIRA championship Saturday afternoon in Hamden. While Quinnipiac was able to come out on top in that battle last year, it fell to 0-2 on the season with a defeat at the hands of the Big Green (2-0). Despite the loss, there were a lot of positives spoken on the Quinnipiac sidelines after the game, which was a similar response to their season opening loss against Harvard. Dartmouth came out flying in the first half, scoring three ties within the first 25 minutes of the game. It was freshman Sophie Ragg, senior Camille Johnson and freshman Emily Henrich that all tallied the tries. 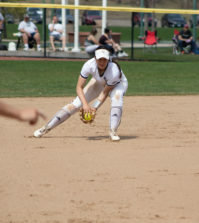 Quinnipiac’s senior captain Emily Roskopf got the Bobcats on the board when she scored her first try of the season. But Dartmouth added another try and went into the half with a 28-10 lead. After the halftime break, Quinnipiac came out much more aggressive. 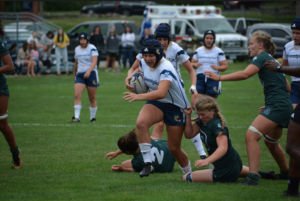 Quinnipiac freshman Mckenna Haz tallied a try in the first few minutes, and then it was fellow freshman Clara Lemal-Brown who brought the Bobcats to within six points when she tore down the sidelines for her second try on the season. However, mere minutes later, it was Dartmouth again with an answer as Ragg got her second try of the game. The defense of Dartmouth remained dominant and did not allow the Bobcats to tally any more points. A late try for the Big Green was the dagger, and they went on to win 40-22. With the Bobcats falling to 0-2 – which is unfamiliar territory for the team – Carlson echoed what Maples had said, in that improving is more important than wins right now. Quinnipiac’s next game will be Saturday, Sept. 8, when it travels to Vermont to take on Norwich University.